The Chia Seed Market is segmented by geography. The report includes production, consumption, and trade analysis of the top 17 chia seed markets across the world. 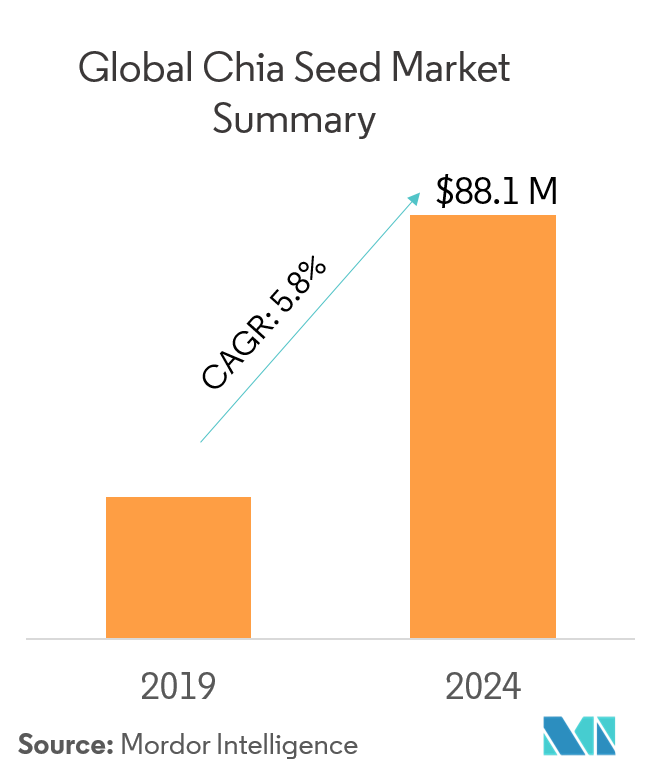 The chia seed market was valued at USD 66.5 million in the year 2018 and the market is projected to register a CAGR of 5.8% to reach a value of USD 88.1 million in the year 2024. Chia seeds do not follow the commoditization trend, as the market is still small, where supply is unstable, and there is a lack of awareness of the high-quality standards demanded by large industries. 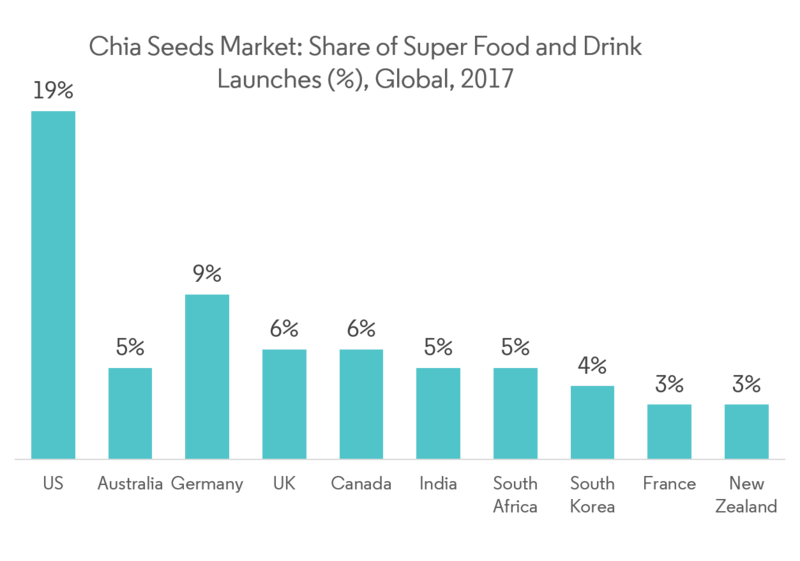 However, as more consumers are now aware of chia seeds and its benefits, the market is likely to witness tremendous growth in the near future, globally. The increased demand for nutritional ancient grains and multi-cereal-based products as functional foods are driving the demand for chia seeds. Chia seeds are gluten-free and have high protein content. The gluten-free property of chia seeds is expected to create a strong demand among consumers suffering from gluten intolerance (celiac disease), or those who simply avoid gluten because of their lifestyle choices. Chia seeds are derived from the desert plant Salvia Hispanica, which is a member of the mint family. Salvia Hispanica seed is often sold under its common name “chia”. Chia is a native of Guatemala, and can easily be produced in the long, dry climate of South American countries, like Ecuador, Bolivia, and Peru, among others. About 80% of the world’s chia supply comes from Latin America. Other countries, like Australia, and to a smaller extent, select countries in the Asia-Pacific regions, are scaling production to meet the global demand. The popularity of “Super” ingredients has increased significantly over the recent past, with product launches, as consumers are more inclined toward natural and wholesome ingredients. These products have superior nutritional value as they are rich sources of polyphenols, anti-oxidants, vitamins, and minerals. The market is driven by consumer preference toward functional and health-based naturally derived products. Chia seeds are readily available in grocery stores because they have a high demand around the world. They contain a good amount of calcium, magnesium, and potassium, and are believed to boost energy, stabilize blood sugar, and help with digestion. A key factor in the sale of “superfoods”, including chia seeds’ availability, may be the accessibility of supermarkets, as compared to traditional grocery stores and convenience stores. In Europe, chia has not only found its entrance in the health shops and specialty stores, but also in the major supermarkets, such as Tesco (United Kingdom), El Corte Ingles (Spain), and Albert Heijn (Netherlands). It is also sold as a food supplement in drug stores. It reflects a growing interest of the main public in health food and ‘superfood’. The American Heart Association recommends fish consumption and the inclusion of omega-3 rich foods and oils (such as soybean, canola, walnut, and flaxseed) in the daily diets to prevent heart disease. However, with time, plant sources of omega-3 EFAs, such as chia seed, is gaining popularity, owing to its easy corporation in the convenience and functional foods and its neutral taste. All these factors are expected to contribute to the growth of the market. 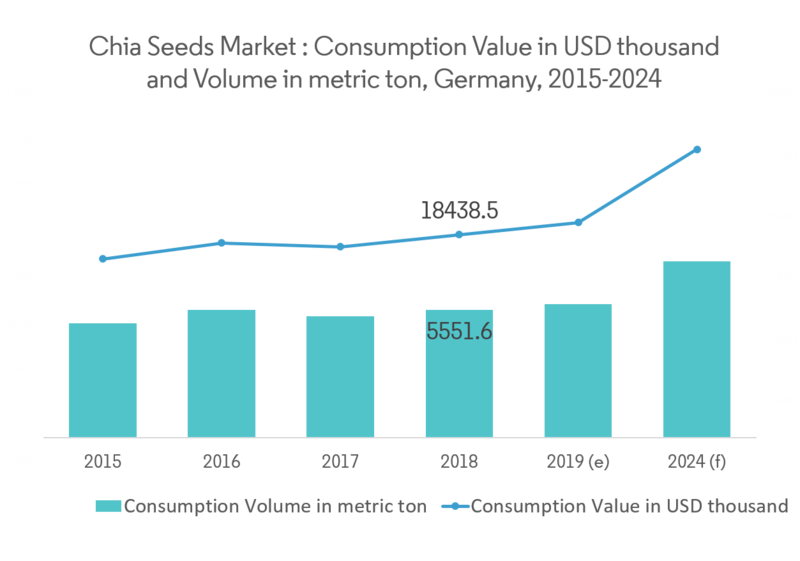 The consumption of chia seeds in Germany stood at 5,551.6 metric ton in 2018, which was valued at USD 18.4 million. Germany was the largest consumer and importer of chia seeds in Europe, and accounted for 40% of the region’s total imports of chia seeds during 2016. From 2016 to 2017, Germany imported about 580 metric ton of chia seeds per month, with Paraguay, Bolivia, and Mexico being its leading suppliers. Naturacereal and Rossmann are the most popular retail outlets for chia seeds in Germany. Owing to an increasing number of vegan consumers in Germany, and with approximately 10% of the entire population already being vegan, the market for chia seeds is gaining prominence in the country. Furthermore, there is increased preference for chia-based foods in the country.